All the way back in early 2011, The Harley Street-based The London Nail Laser Clinic appointed CuCo to re-design their website. The clinic wanted to promote their pioneering services available to an international clientele. The site was reconstructed around the core message of ‘Happy Feet’, explaining fungal nail infection in straightforward terms and offering reassuring, step-by-step advice on the effectiveness and safety of laser treatments. CuCo designed and developed the site using CMS WordPress, and it was built around many of the core features of WordPress, relying heavily on custom fields and custom posts to create a very simple to administer site. In addition to giving the web platform a more positive and dynamic look, CuCo also streamlined the content and improved the site navigation to offer prospective clients the easiest possible access to the facts and treatment options. The London Nail Laser Clinic were so happy with the results that they appointed CuCo as their dedicated digital agency for all of their marketing solutions. 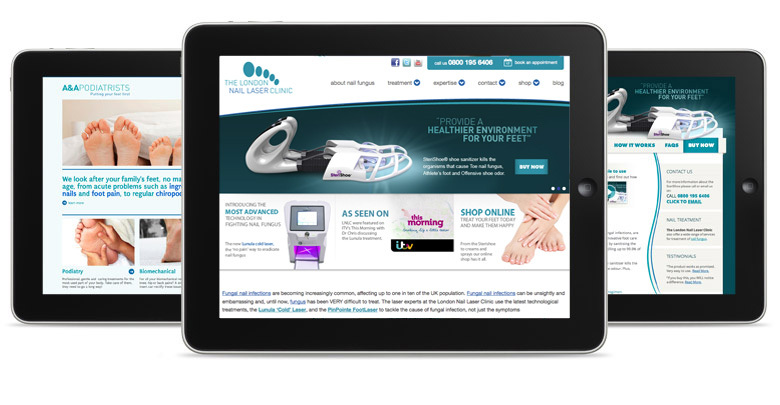 CuCo have since gone on to design and build two other associated websites for this prestigious London clinic; one to promote their product SteriShoe and also a website which is specifically for the other arm of the business, A&A Podiatrists. The success of The London Nail Laser Clinic’s websites are a great example of how CuCo’s excellent design work has the power to translate into fantastic results! When CuCo first began the digital marketing for The London Nail Laser Clinic at the start of 2011, visits to their site doubled within the first month. With the redesign of their two sites and the creation of a third mini-site, their website visits started to average at just over 150% a month on their main site compared to what they were before coming onboard with CuCo. CuCo also took on responsibility of managing their Google Adwords which saw a significant increase of click-through rates. As well as seeing a further increase in traffic to their site, CuCo increased their click-throughs from the ads, doubled their impression rate, and reduced their cost per click by 17.5%! In less than a year, CuCo succeeded in decreasing the clinic’s website bounce back rate from 70% to 40% – meaning that visitors had more interest in navigating away from their landing page and reading more of The London Nail Laser Clinic’s website. Are you looking to re-design your brands website? Give CuCo a call today on 01202 911959 or email us at hello@cucocreative.co.uk. Our team are experts in designing and managing websites for clients in a wide range of diverse industries, and we’d love to chat about how we could help your business succeed online!